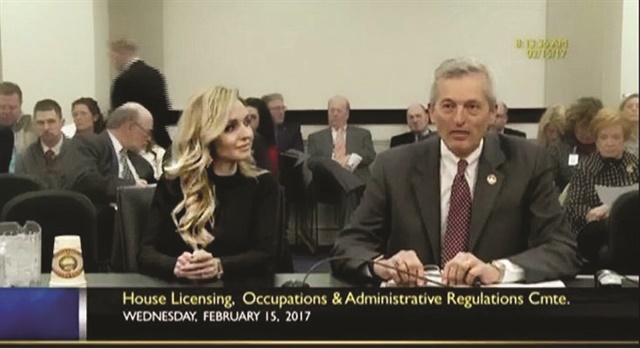 Jill Higginbotham and Representative Jerry Miller of Kentucky testifying before the Licensing Committee on February 15, 2017. When Jill Higginbotham, owner of J Michael’s Salon and Spa in Louisville, Ky., learned that providing complimentary alcohol at the salon wasn’t allowed under Kentucky law and that salons weren’t eligible to apply for a liquor license, she immediately set out to change the law. She started by reaching out to her local state representatives and senators. “Through my research, I found that most states have many of the same laws and regulations,” says Higginbotham. “To change a law, you need a lawmaker to hear you, back you, and take it to the floor.” She reached out to Representative Jerry Miller, a member of the licensing committee, who connected her with the commissioner of the Kentucky Alcohol and Beverage Commission (ABC). She was invited to testify before the committee, who would vote on whether to send the issue to the senate. The topic generated many questions, but Higginbotham had prepared with research about laws in other states. Although California had recently passed a law allowing salons and limos to serve two glasses of wine, champagne, or beer free of charge, Higginbotham and Miller realized that the Kentucky legislature was less likely to vote yes on a proposal modeled after California or other western states. Instead, Higginbotham cited Ohio, where laws are by county, and Virginia, which allows salons and spas to apply for liquor licenses. She also highlighted the potential tax revenues that would result.